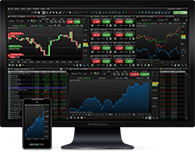 ProRealTime has a direct connection to the world's major exchanges. Each connection is in Push mode, ensuring every tick on the exchange is instantaneously shown on your charts. The benefits of ultra low latency datafeeds become especially apparent in high volatility markets when prices can change very quickly. 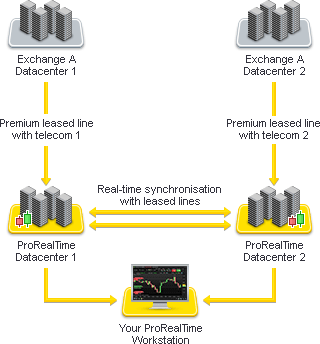 To ensure the availability of the datafeed, ProRealTime mainly uses multiple dedicated high-speed leased lines between multiple datacenters of the exchanges and ProRealTime multiple datacenters. This means that the data is sent from the exchange along separate and independent channels to separate datacenters to avoid any loss of information that might otherwise occur (see image). 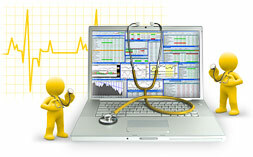 All channels are active and either datacenter can be accessed by your ProRealTime workstation at any time. The ProRealTime servers use the latest technology to maximize availability and the datacenters are in different geographic locations. Even with a low-latency feed direct from the exchanges, incorrect data points may be caused by telecommunication network lags. ProRealTime's data engineers monitor the datafeeds using the latest technologies to remove incorrect ticks on both intraday and end-of-day data in our databases. Additionally, feedback from our user base (one of the largest in Europe) helps us to correct any errors not caught in the first process. 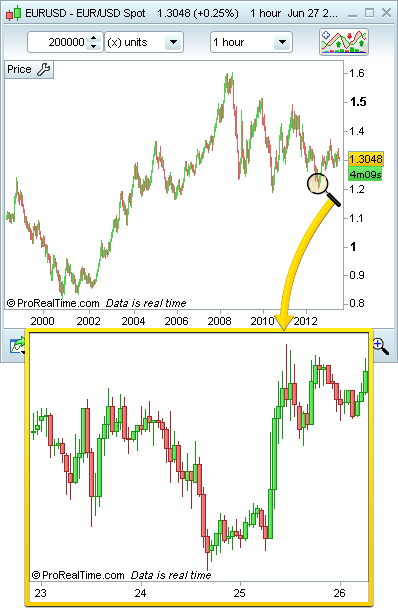 ProRealTime allows you to select the chart timeframe of your choice with limitless flexibility (see image). Freely choose the number to input for (x) minutes, hours, seconds, days, weeks, months... and ProRealTime generates the chart! 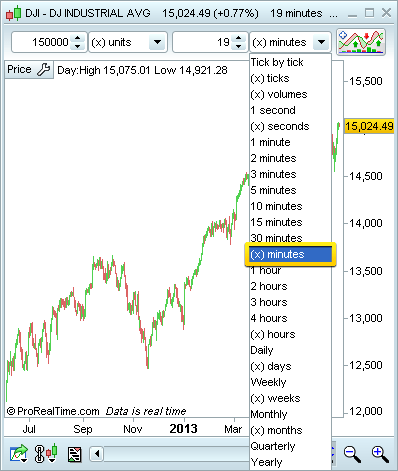 ProRealTime charts can be adapted to the user's timezone. This goes further than simply changing the time displayed for each candle. For example, in 24-hour markets, the user can choose to whether to reconstruct daily candles based on intraday trading hours of his own timezone, which can in turn influence popular technical indicators such as pivot points. Additionally users may prefer to adjust the data displayed on their charts after stock dividends or future rollovers in the case of continuous futures charts. 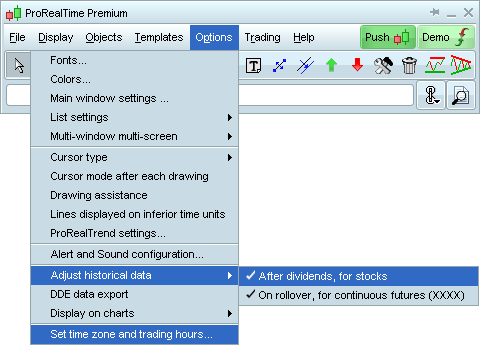 These options that the user can select make ProRealTime an ideal tool for analysis in these markets.